Capalbio Italy. 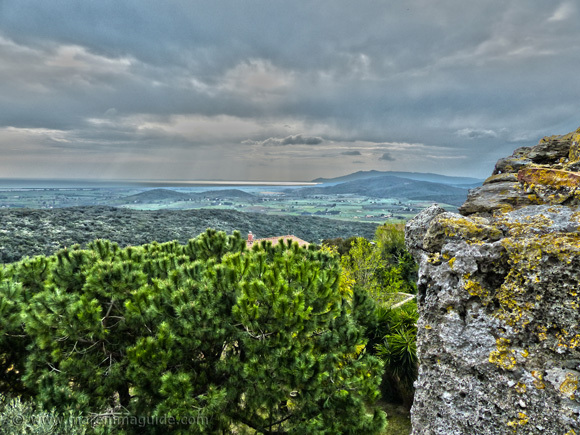 The last fortification between Tuscany and the Lazio border that once divided ancient Maremma between the Granducato di Toscana and the Roman Pontiff. 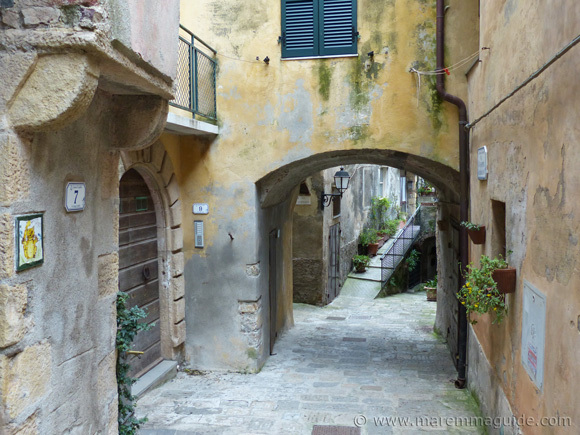 As stronghold Tuscan hill towns go, it sits proud against a backdrop of softly rolling wooded hills and olive groves, and invites you to visit. 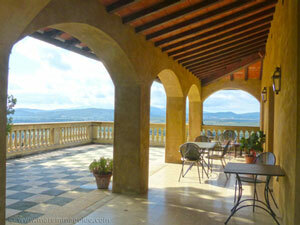 Indeed, this is one of Maremma's most famous locations, included in any guide book on Tuscany. 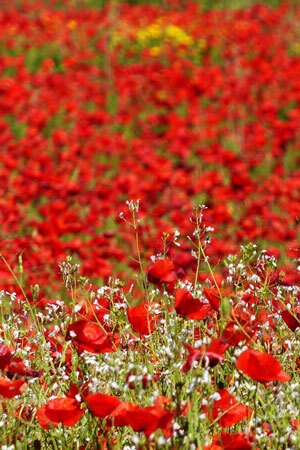 And twice I have made the long drive with friends to reach it on a summers day. But each time it left me disappointed. Rare double medieval city wall and all, I didn't return home keen to put pen to paper. The 11th century tower and Porta Senese gateway. All because of a sense of displacement. 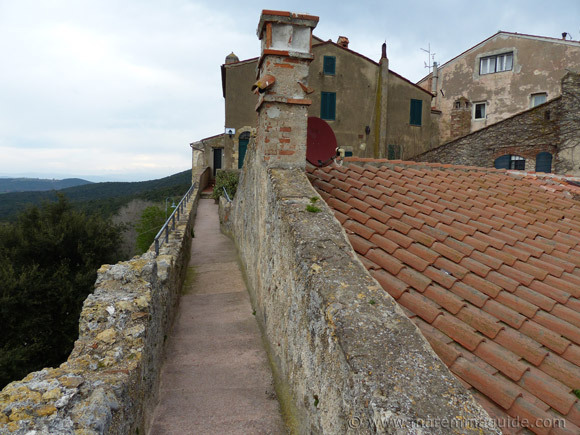 The normal, everyday, inconsequential things of rural life that you find inside Maremma's other walled hill towns and villages, such as cats sat on those same said walls staring at the view. A toddler on a trike being taken for a stroll by granddad. Washing hanging out of the terrace. An Ape parked-up here or there. And old ladies sat together on chairs outside their front doors, chatting away. Were missing. Replaced by very expensive boutiques, bars, restaurants and art galleries. And people there to be seen. 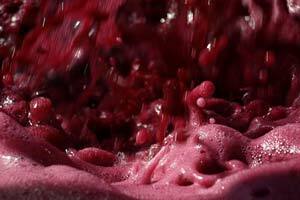 Because Capalbio is less than a two hour drive from the centre of Rome and has, for some decades now, been the favoured weekend watering hole of well known names and politicians from the Eternal City. 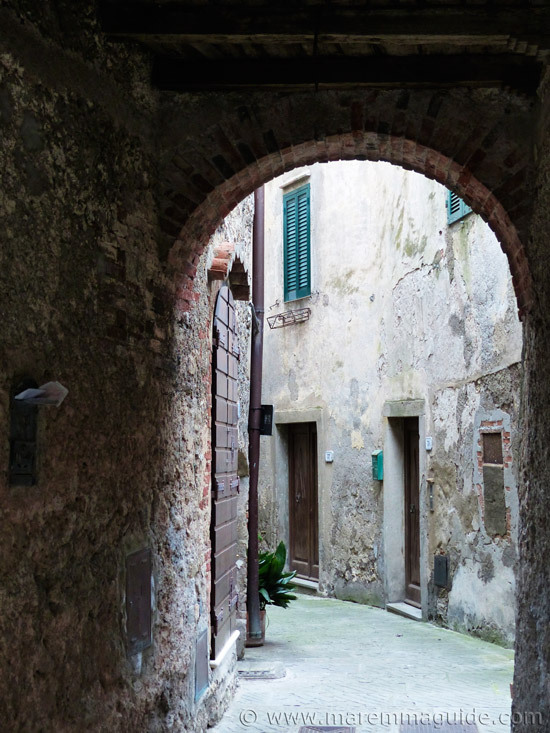 Looking out from within through the double-arched Porta Senese gateway. What had once been home to Iron-age man, loved by the Etruscans, and absorbed and expanded by the Romans. Born the brunt and fallen to Ostrogoths and Lombards. 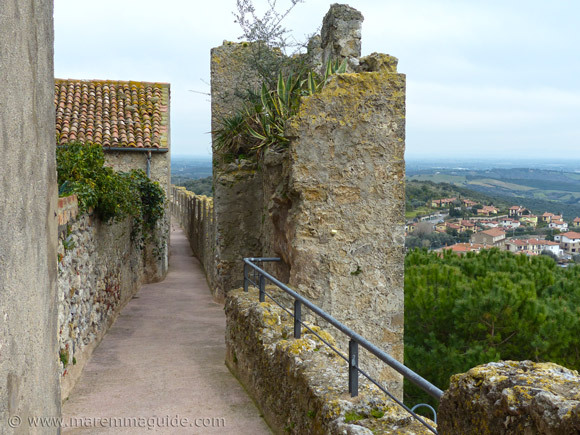 Been re-built and fortified in the middle ages to become the last bastion between the Tuscan border and Rome. Stood strong against Spanish military. 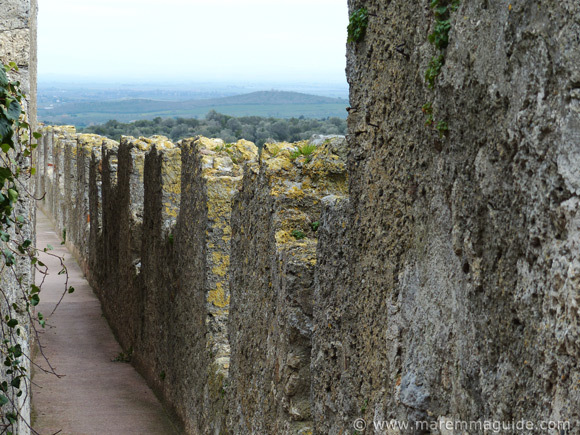 Witnessed Saracen raids along its coast and suffered from Maremma's rampant malaria and more, oh so much more. Felt false. And then I visited again. 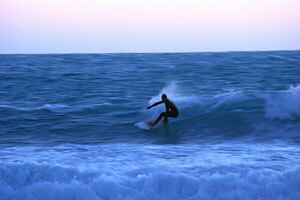 One windy, overcast Sunday in March and found Capalbio. 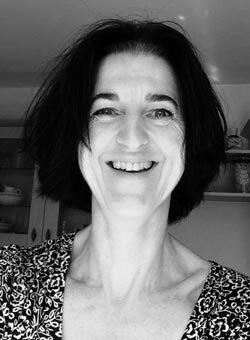 In her in last year's unfashionable austere winter coat. 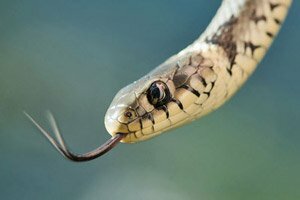 Without her make-up on. And she told me what she was all about. With the place practically all to myself, I felt her history under my feet as I walked and saw its layers in front of my eyes. Bursting from every turn, corner, and alleyway. So go visit, but not in summer. 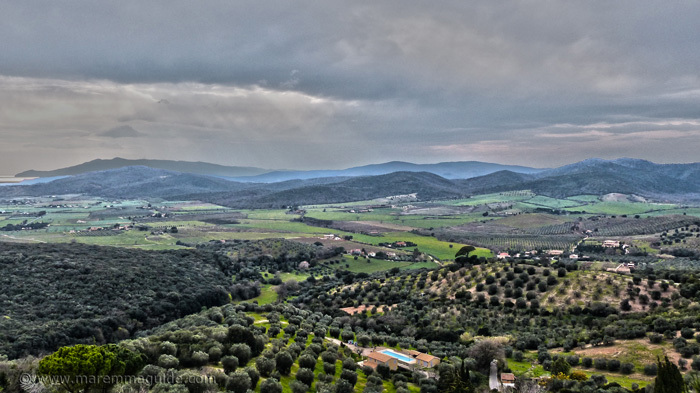 The hill on which present-day Capalbio sits was inhabited by iron-age man, then the Etruscans between the eighth and seventh centuries BC. 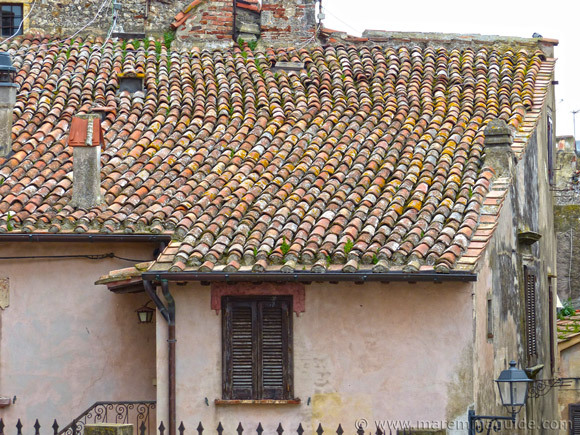 The Romans took it from the Etruscans and made it their own. But with the fall of the Roman Empire on 476 AD came the beginning of one of its worst periods. Invaded by Ostrogoths and Lombard barbarians. 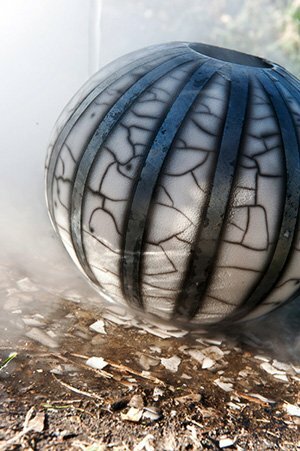 Once it would have stood even more distinctly against its background. 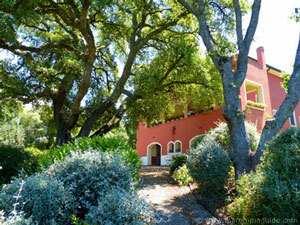 For the wooded and olive grove covered hill on which it sits was once bare rock. Alabaster. Which shone white in the sunlight. And from which it is believed that Capalbio took its original name of Campus album, Caput calvum or Caput album. The earliest surviving documentary record mentioning the town is that issued by Charles the Great, The Holy Roman Emperor, in which he donated a lot of properties in Tuscany to the Abbey of Saints Anastasio and Vincenzo of the Three Fountains of Rome, including the "castrum Capalbi" (Capalbio castle). There is some archaeological debate as to whether that document is actually referring to another site, but the next, over which there is no doubt, was written on 10th July 1161. This time it is a "privilege" issued by Pope Alessandro III to the Abbot of the same Abbey, Abbot Baldinone, the abbey's Tuscan possessions, including the "Castrum Capalbj". 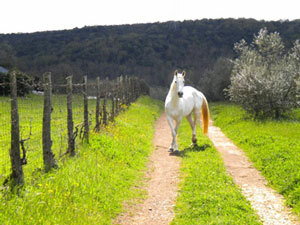 In the 11th century Capalbio was sold to the powerful Maremma noble family, the Aldobrandeschi. Who set about reinforcing the first wall around the city and building its second. A century later and a game of ping-pong of ownership of Capalbio began in earnest. In 1216, when the territories of the Aldobrandeschi family were divided between its different arms, Capalbio entered the Santa Fiora branch of the family. 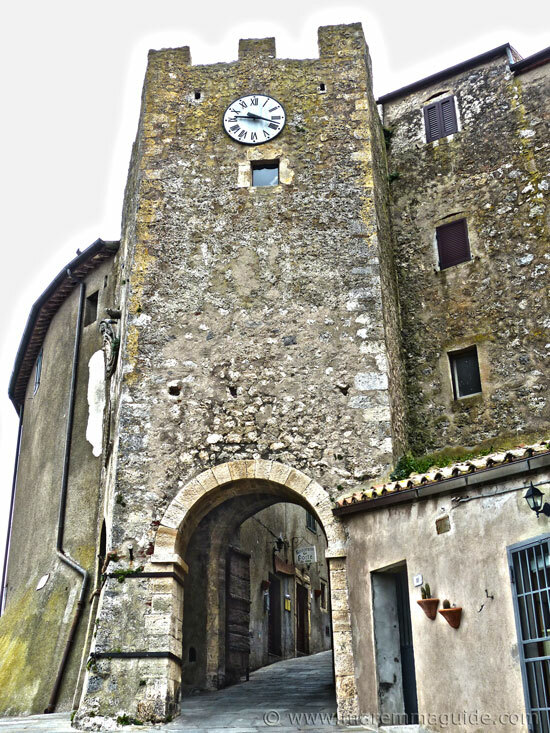 Fifty-six years later in 1272, after sour battles between the Guelphs and Ghibellines in Maremma, it passed to the Sovana-Pitigliano branch, to end-up under the control of one Count Ugo il Forte. 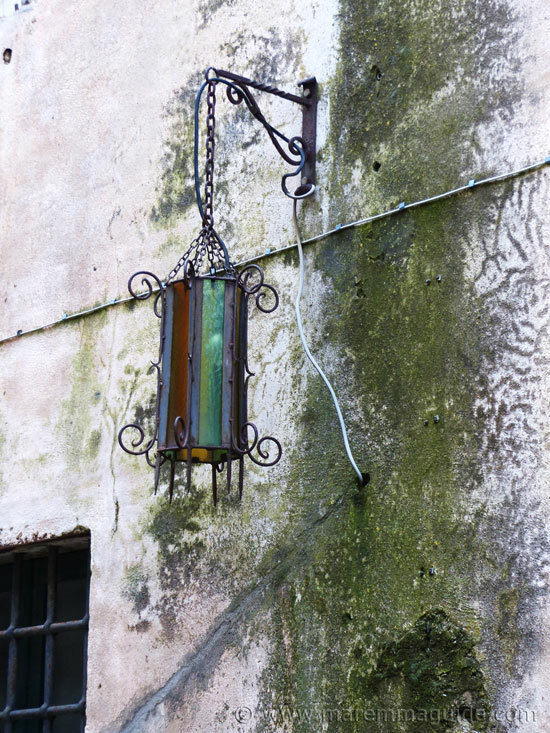 Towards the end of the fourteenth century the Aldobrandeschi fortunes and power began to wain, especially at the hands of the Sienese who sought to control much of Maremma's mines and wealth. 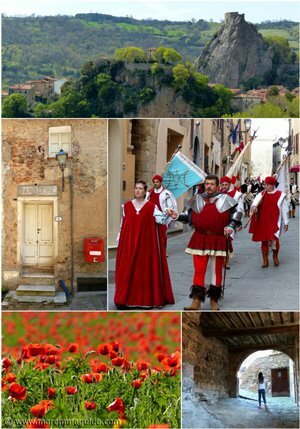 The family concentrated their attentions on their northern territories, whilst the city of Orvieto took its opportunity to head south with its troops and conquer what it had had its eyes on for some time. Which included occupying Capalbio. They had to pay the Holy See some 13,000 "fiorni" to call it their own. Despite doing so and Capalbio becoming their dominion in 1312, they had to defend it constantly with their militia against sieges by the Santa Fiora counts who wanted it back. Six whole years of them. 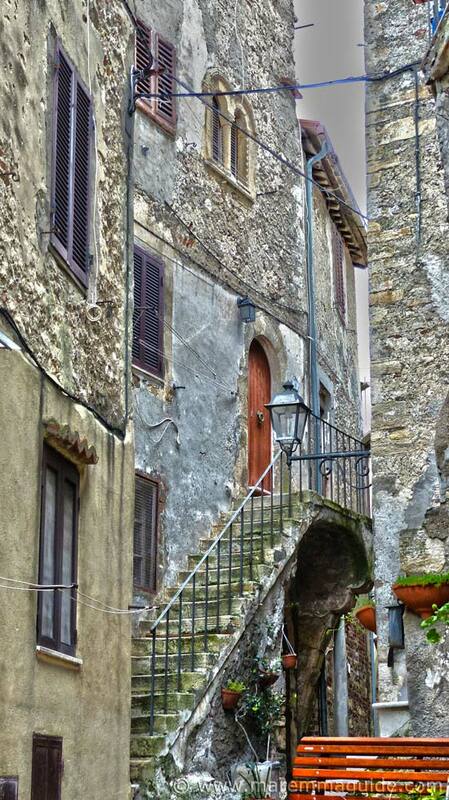 In 1318, the Aldobrandeschi of Santa Fiora won the day and Capalbio was theirs again. 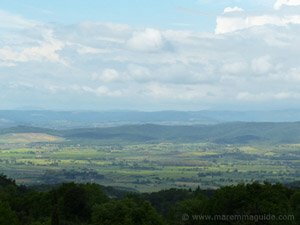 But the decline of their power and rule in Maremma continued. 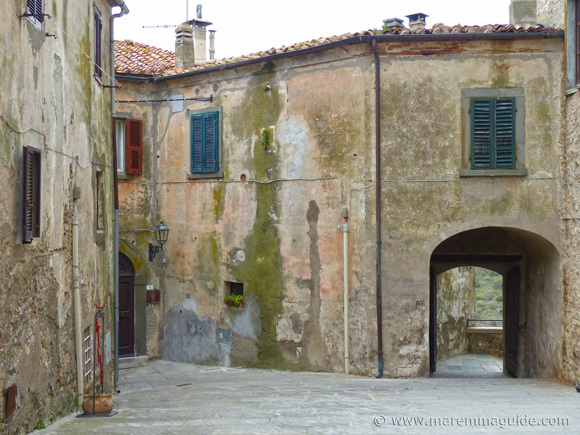 The submission of much of Maremma under Sienese control was concluded in 1416, supported in much part by the citizens of the towns affected who felt securer under Sienese rule. Submission brought with it economic advantages and the saw the Republic set about restoring and reinforcing its newly acquired fortresses and castles. 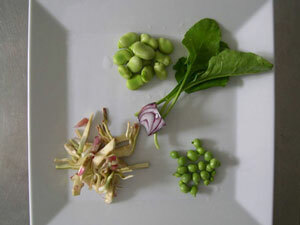 Including Capalbio. It is at this time that the white marble coats of arms that you can see above the Porta Senese arch facing the coast were added. 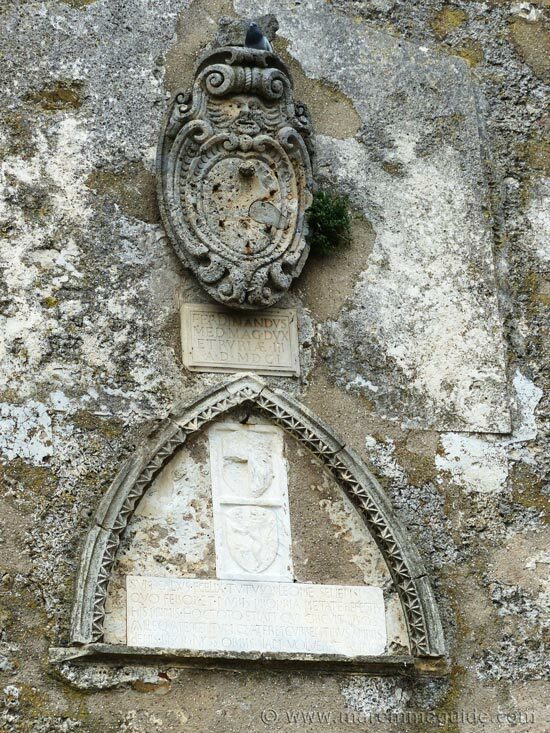 The plaque is dated 1418 and tells of the restoration of the city walls by the Sienese when they conquered Capalbio. Above it sits the older looking, but in fact, younger, coat of arms of the Medici family with an inscription dated 1601.
oltre i quali il mondo aveva girato dieci anni e più volte due. beyond which the worrld has turned ten years and twice more. 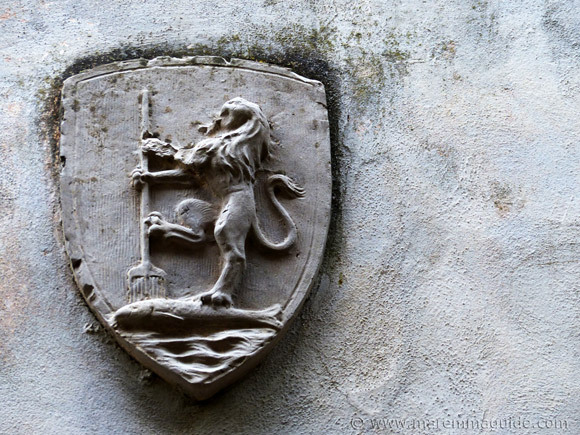 And a closer look at the marble coat of arms reveals a lion supporting a human head. Capalbio's medieval coat of arms was a bald human head. Siena's rule saw a new design and the addition of the supporting Sienese lion. 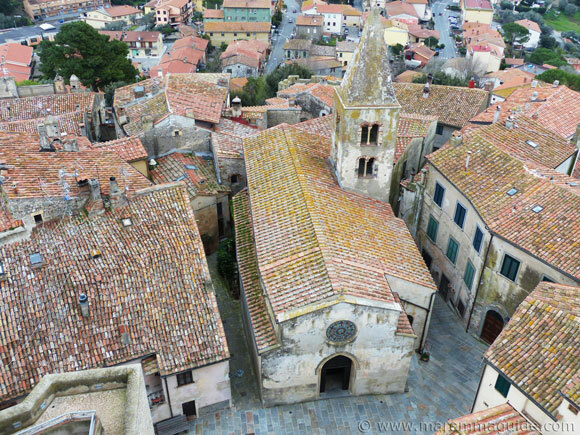 What followed in Capalbio was a period of prosperity accompanied by the building of houses and churches within and outside the city walls. Which, skipping a lot of Aldobrandeschi history, takes us to the 16th century and the year 1555 and the Siena-Firenze war. There are battles raging throughout Tuscany between Florentine-Imperial and French-Sienese armies and Capalbio supports the Republic by resisting attacks by Spanish troops, part of the Florentine Medici forces. After the fifteen month siege by Spanish troops of the City of Siena ended on 21 April 1555, in June Porto Ercole and Orbetello fell too. And Capalbio surrendered, fearful of Spanish reprisals in the full knowledge of the atrocities committed at the fall of Siena. Piazza Magenta in Capalbio is one of the most photographed squares in Maremma, but it is it isn't the best part of Capalbio to photograph. 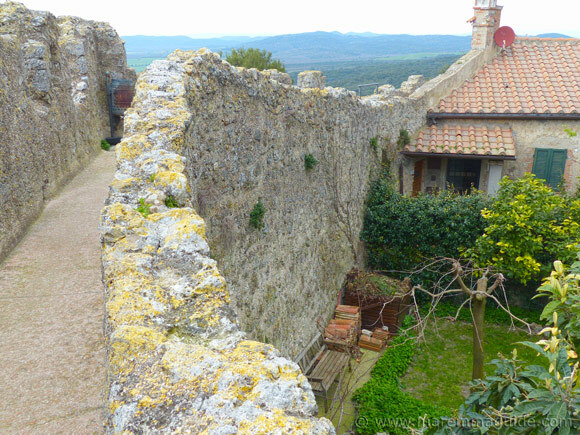 It is along its medieval crenelated wall and inside its narrow streets that your camera card will burst! 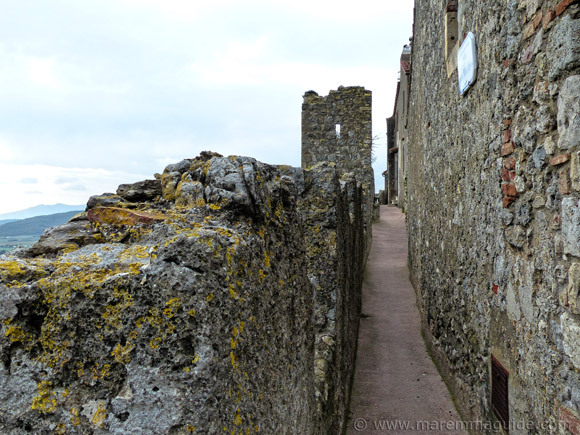 Capalbio has two city walls - "cinta mure" - both of which have a chemin de ronde. 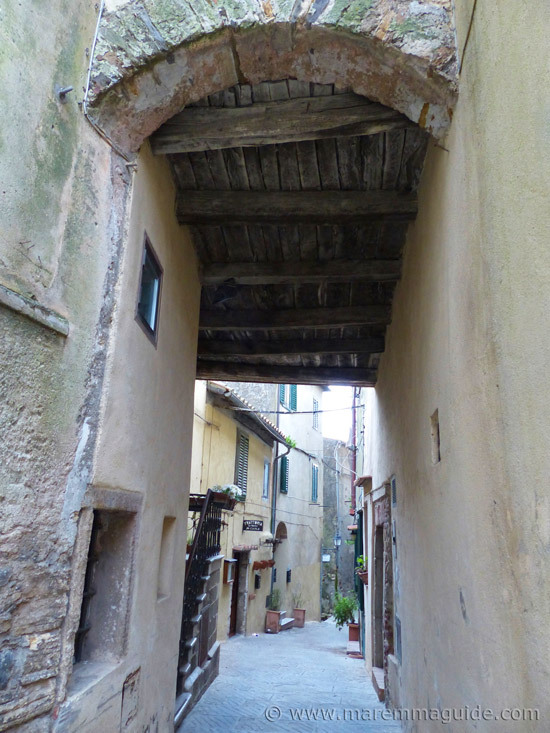 The higher called "cammina di ronda", and the lower, "camminamento basso". Mum's and dad's be aware. For good reason, children under the age of 12 years are not permitted to access the upper chemin de ronde unaccompanied by an adult. There are notices at each of the access points (in Italian.) At point along its length, the Guelph merlons are all but gone and the remaining wall very low. The drop down to the chemin de ronde below is a long one. 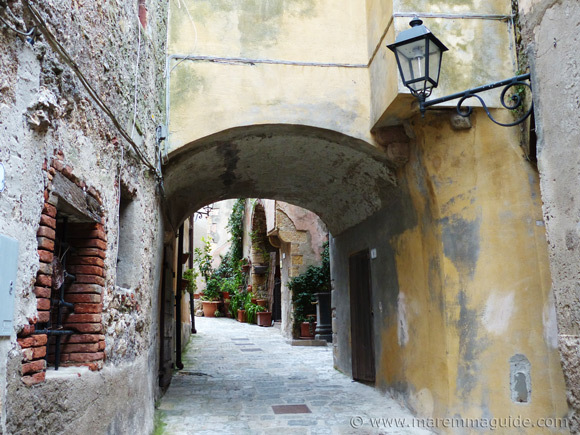 You can gain access the "cammina di ronda" in two places. 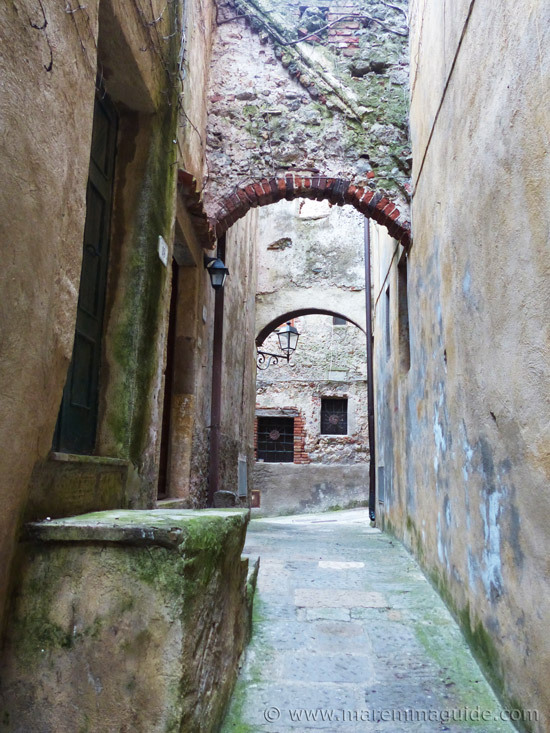 The first by a stone staircase in a corner of Piazza Magenta. Once up, this is the view looking left. Looking right. Along the route you'll find houses that share the internal second wall as their front wall, whose front doors open onto the chemin de ronde. Front doors with a spectacular view. 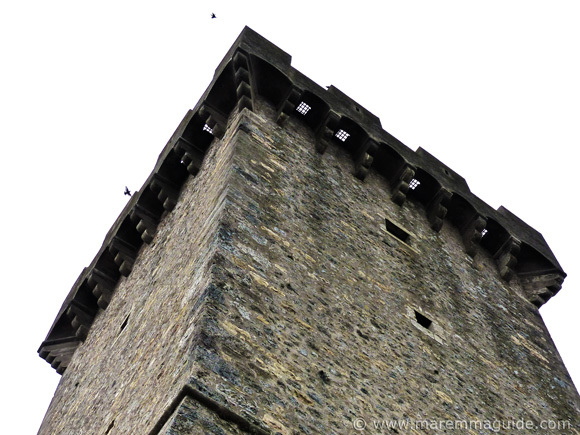 The original external and first built wall had many integral rampart towers. The remains of one now looking down upon modern Capalbio below. Carrying on along the wall will have you looking down into tiny gardens and postage-stamp sized private terraces that are all but private on busy summer days in Capalbio. 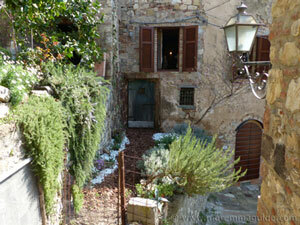 For this town is one of Maremma's most visited on weekends and holidays. 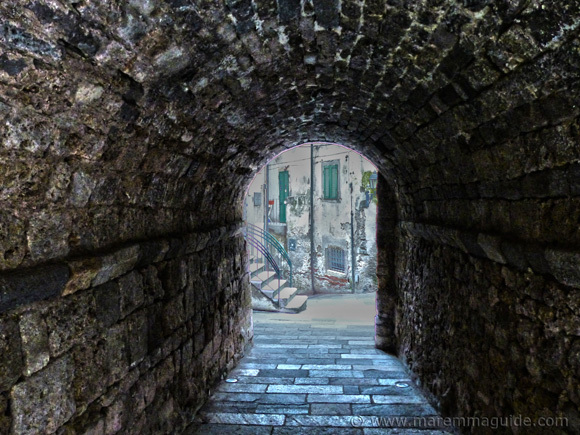 Looking inside into Capalbio behind the wall and your second view of the "Torrione". The view from the walls to the sea. If you had been stood on that wall during the June 1544, you would have known that down along that coast the Saracen pirate, Corsair Barbarossa Hayreddin Pasha, and his Ottoman fleet were raiding Maremma. During twelve long days he sacked, burnt and captured Isola d'Elba, Piombino, Castiglione della Pescaia, Talamone, Orbetello, Montiano, Porto Ercole and the Isola del Giglio. Leaving them in ruin. Strong men and women, capable of surviving the journey to Constantinople and a life of slavery were boarded onto his ships. One-hundred and fifty seven from Talamone, 300 from Montiano, 200 from Port Ercole, and 632 from the Isola del Giglio. The population of Giglio was gone in one day. His men returned just to be sure. Those not fit for sale were slaughtered. The few fortunate enough to have escaped faced a future without shelter or food in a land already notorious for its extreme hardship full of malaria. Most didn't even have shoes before he arrived. Further along still will take you to its end, in the sense that you cannot proceed further around the original circle because a house was built encompassing the wall and the wall-walk now ends at its front door. 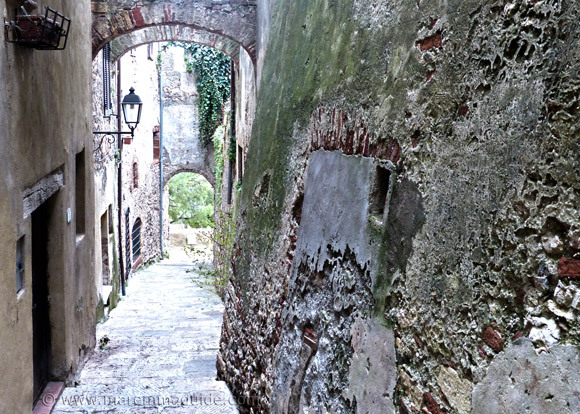 The route down into Capalbio is here. 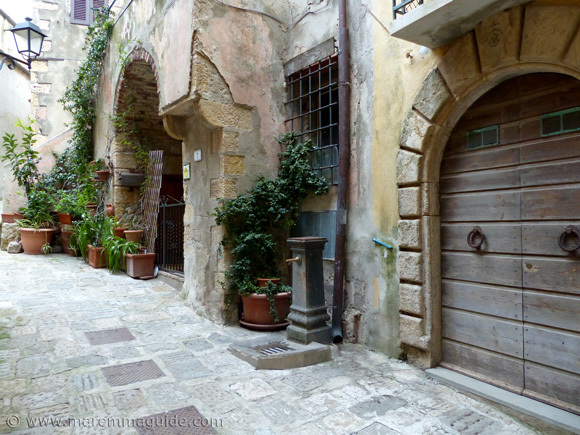 When you walk down and up the steps of Via XXIV Maggio into Capalbio the streets and alleyways are crammed full of details. So many that it is hard to take a photograph that isn't bursting with too many. Post in the letter box waiting to be taken indoors. The Sienese lion again, this time the sea-lion. 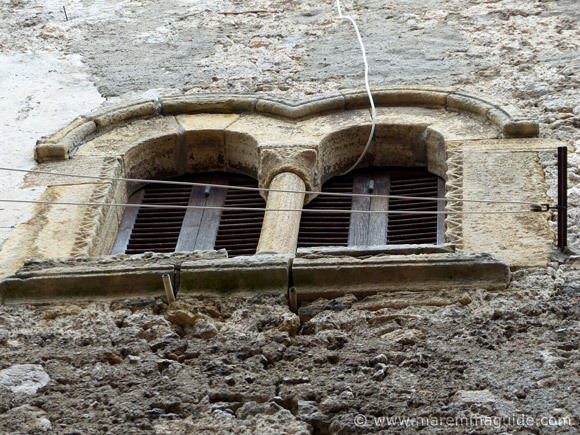 If you look closely at the one below you can see writing engraved around the central round design between the two windows. 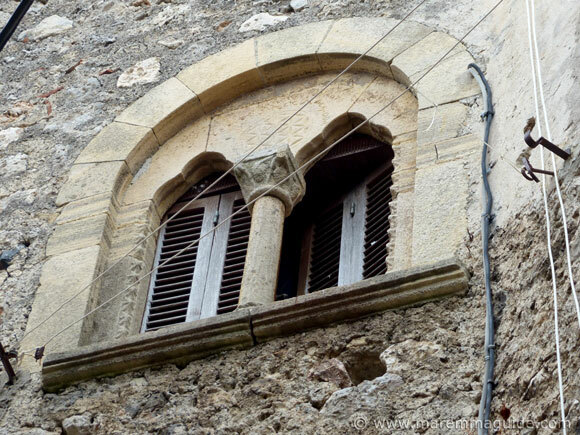 Three with "archi trilobate" - trefoil arches. 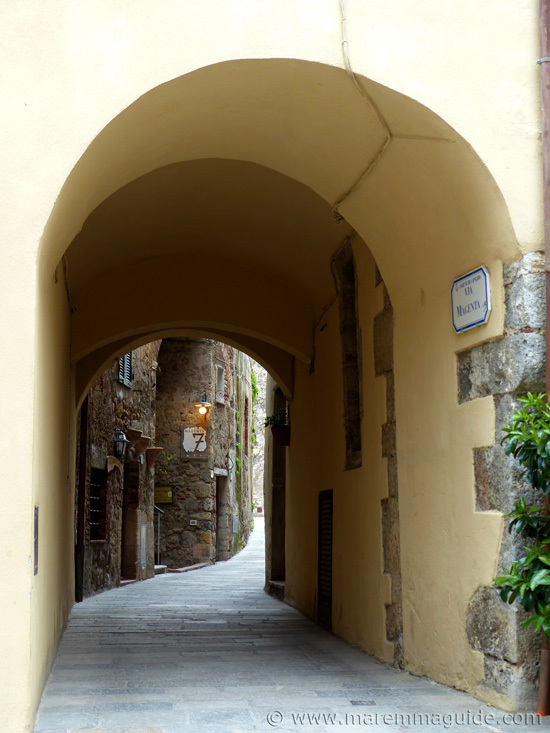 And two with "archi a tutto sesto" - round arches. 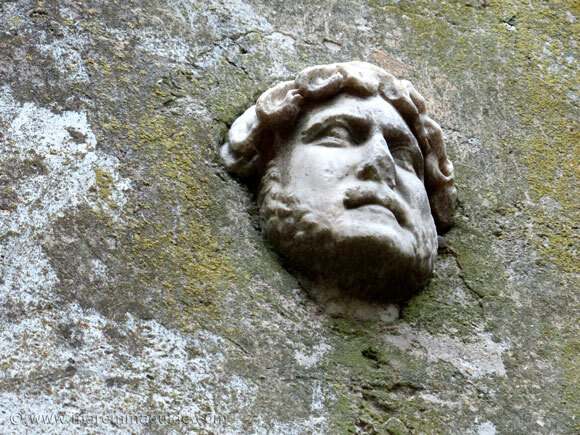 On the wall above the southern entrance to the Arco Santo you'll find a marble portrait of the Roman Emperor Publius Aelius Traianus Hadrianus, or simply, Hadrian. It is an original and is thought to have come from the ruins of the nearby ancient - we are talking 273 BC - Roman city of Cosa. 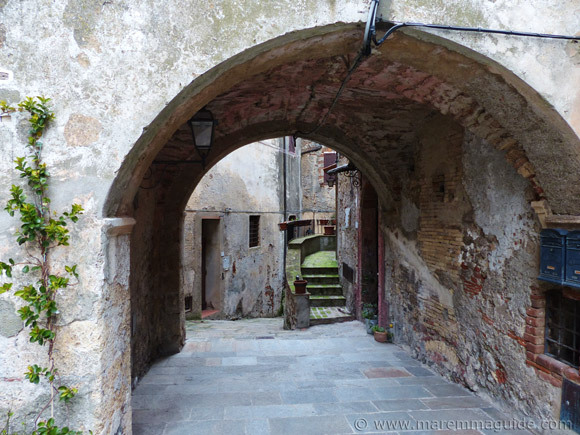 The Piazza della Rocca and the second "Porta" entrance and exit into Capalbio. 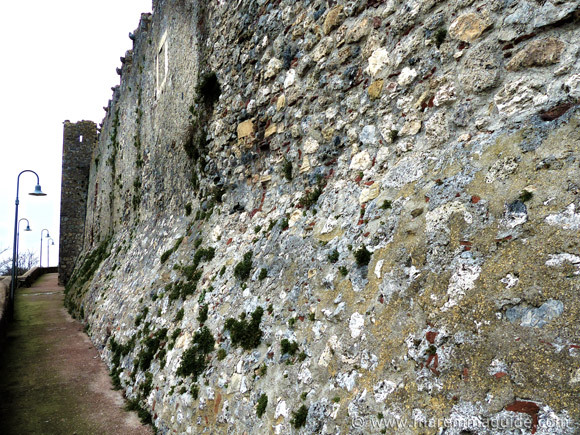 The entrance to the castle is in the wall on the right. 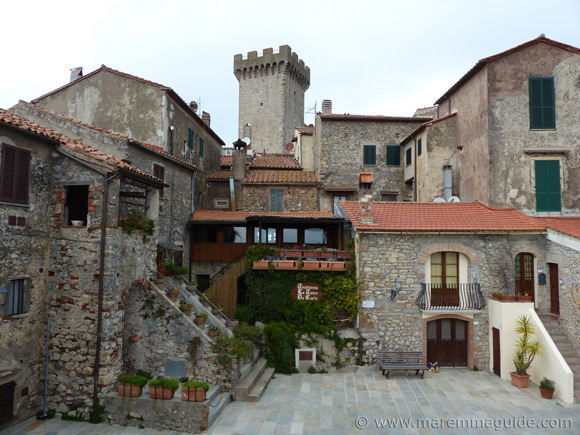 If you leave the historic centre here, the street takes you down stone steps to the "camminamento basso", around Capalbio with a stunning view to the sea, and back to the Porta Senese. The original part of the church of San Nicola occupied the rear section of the church - coterminous with the covered passageway of Arco Santo - and is thought, by virtue of its mullioned windows and Romanesque capitals rudimentarily carved with zoomorphic decorations, roses, bunches of grapes and stylised leaves, and a few animals, an eagle and a lion thrown in for good measure, to have been built in the twelfth century. 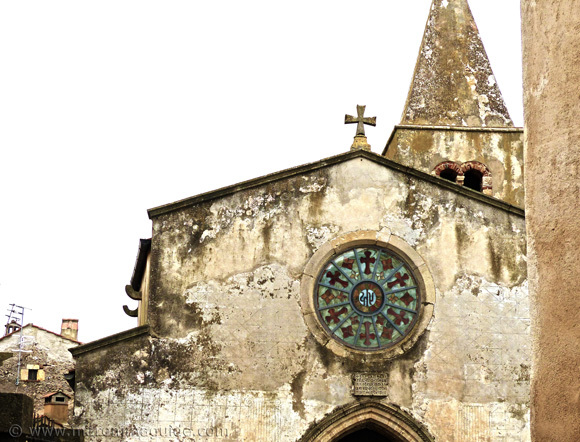 The church was extended and restored in 1446, at which point it is believed that the bell tower was added too. In 1919 the tower's Sienese style cupola, was replaced with today's brick ten metre high pyramid. Inside you will find frescoes in the four chapels (non-interconnecting alcoves) in both side walls of the church. Painted over in white during the 17th century, they were rediscovered in 1936 by a painter and restorer, Cesare Vagarini. Who set about arbitrarily filling-in some of the missing pieces. 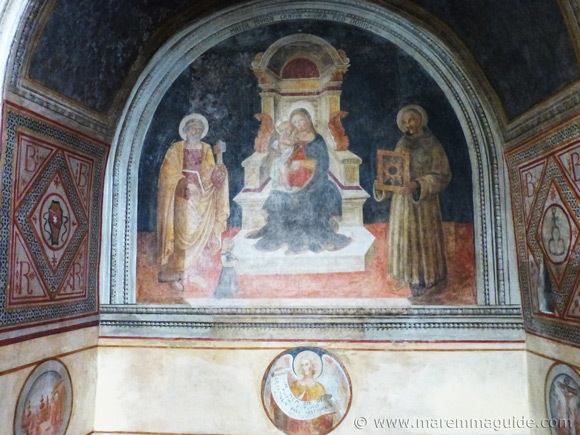 In the left chapels, frescoes dated from the Sienese school circa 1300, and in the chapels on the right from the Umbrian school, circa 1400. This one - in the second alcove on your right when you enter - is the "Madonna col Bambino" (Madonna and child) seated on a throne. With Saint Bernadino of Siena on the left (completely repainted by Cesare Vagarini in 1936), and the apostle, Saint Pietro, on the right. At their feet, in much smaller dimensions, is a tradesman. (One source says that he is kneeling, but looking at him I have to say that his proportions don't suggest as much.) On the right wall an elaborately painted square with a cross at its centre. And one similarly on the left. Both bear the initials, "B R", which are probably those of the commissioner of the painting. Note. the exception. The fresco in the first chapel on the left - which is the baptistery - is not of the 14th century. 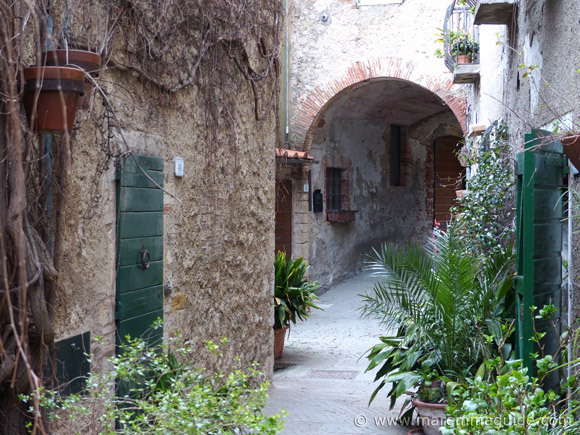 In 1800 the wall here with its Sienese fresco was demolished to make a door into Via Garibaldi. The fresco you see today was painted in 1937 by professor Bagarini of Siena on the occasion of the general restoration of the church. It represents St. John the Baptist baptising Jesus in the Jordan River with the Good Shepherd on the right and Mary Magdalene on the left. I love the "movement" of the albeit static terracotta tiles. 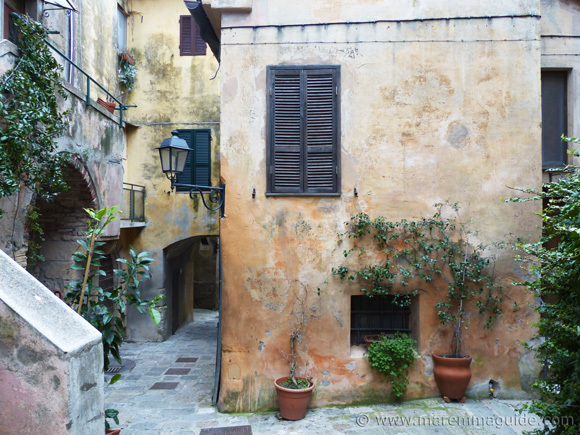 The pink house is on the other side of Via Garibaldi, where that door cut out of the church wall in 1800 once opened. 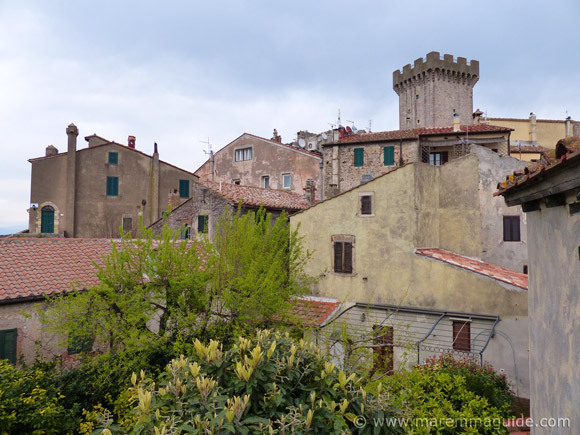 If there is one thing you must do in Capalbio, it is to purchase a (really cheap - and kids go free) ticket to climb the "Torrione" - tower - of Capalbio's Rocca Aldobrandesca castle. Actually, the ticket is for visiting the whole castle, but the rooms of the Palazzo Collacchioni won't take you long and it is the tower that is the star. 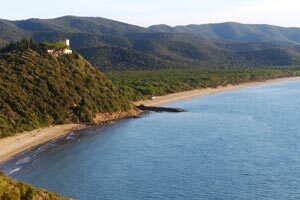 The 360 degree view is stunning: both down over the roof-tops of Capalbio, out across olive groves and wooded hillocks to the sparkling coastline of the Costa d'Argento (Maremma's Silver Coast), and inland across sits wooded "colline" (hills). But, if you suffer at all from a fear of heights, you will remember the ascent and descent much more than that view! 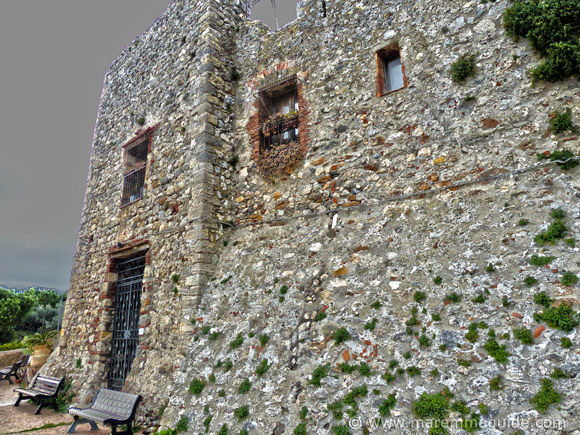 Find out why - the Rocca Aldobrandesca in Capalbio and the tale of trembles in the tower! 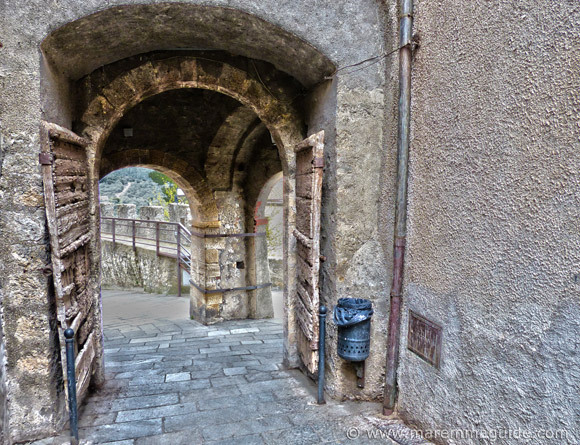 If after climbing the "Torrione" of Capalbio's Rocca you are in need of a sit down and something to drink, camomile tea or something stronger, then my recommendation is to head on back from the Piazza della Rocca and the Piazza della Chiesa towards the Porta Senese to Via Magenta - the street that takes you to the Piazza of the same name where you went up or came down from the wall walkway. To bar Magenta 7 which is housed inside those same said walls. Via Magenta and Bar Magenta 7. 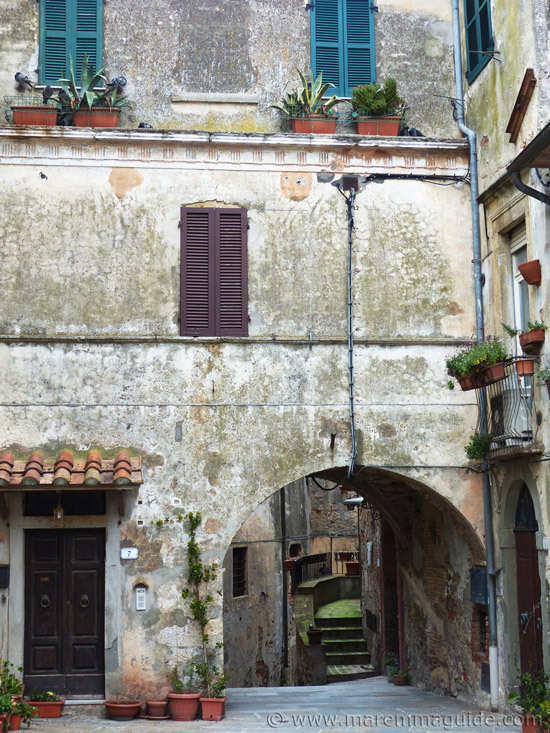 It also has an entrance door in the buttressed scarp of the other side of the wall that opens directly onto the "camminamento basso", with outdoor tables in the summer from which to stare at that view. 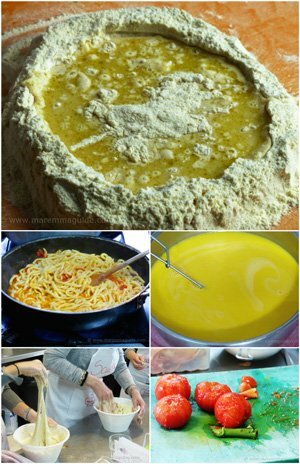 With a really friendly atmosphere - down to the lovely Polish lady who owns it (she lives in Capalbio with her Italian husband and family) - you'll find yourself amongst locals as well as holidaymakers and weekend visitors, sat around small tables passing the time away Italian-style. Choose from espresso, cappuccino, teas, artisan beers, local wines or an Italian, very thick and dark, hot chocolate. Open from early morning to late at night it also makes for an atmospheric stop too for something light to eat, from crostini, bruschette, to panini and "taglieri di salumi e formaggi" (slices of salami and cheese served on a wooden board with bread). PS. When you are in the bathroom washing your hands and wondering how to get water out of the tap, guessing that the handwritten sign on the napkin in a plastic sleeve above the tap is probably trying to tell you something. It is. The peddles to turn the water on are hidden under the cabinet in which the sink sits. Put your foot in the gap under and press! 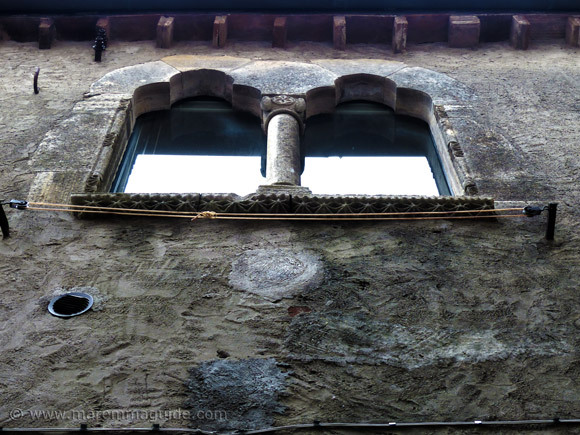 For me in March, a pot of camomile tea drank whilst scanning my photos and listening to Annie Lennox playing on the radio was the perfect medicine for my post "Torrione" visit. My leg muscles relaxed sufficiently for me to make the long drive home in the dark to the other side of the Maremma Grossetana border, this time with Livorno. 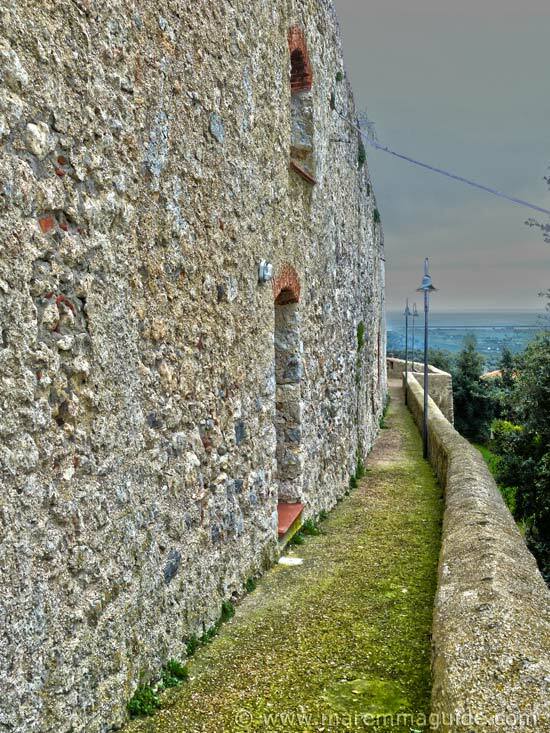 And then take a walk around the outer walls called the "camminamento basso". 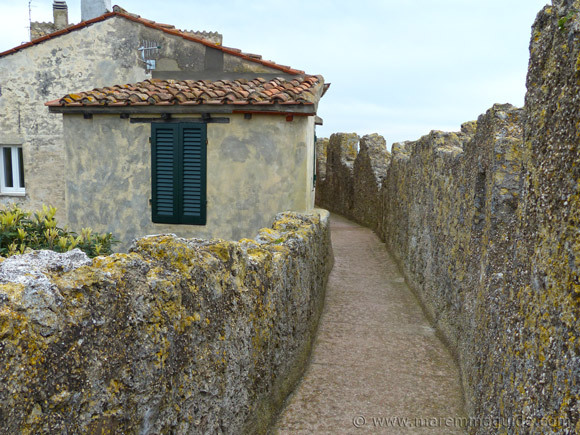 From the wall you can see the glistening sea and sands of the Marina di Capalbio beach and the sun reflecting off of the main Aurelia road that runs along the coast in Maremma and which you probably drove along to reach Capalbio. But in 1949 that wasn't the only thing that was glistening, because very near that very same exit that you probably took to drive inland and up the hill to reach Capalbio, 93 silver Roman coins were found during agricultural works. early all of the coins were Denarius and Quinarius Argenteus dated the year AD 81. But you won't find them on display in Capalbio because they were brought by American archaeologists and are today housed in the Wheaton College of Norton in Massachusetts. Maremma's infamous bandit, Domenico Tuburii, likened by some at the time of his life to Robin Hood, was killed at 03:30 in the night between the 23rd and 24th of October 1896, in a shoot-out with Carabinieri police in the nearby locality of Le Forane, on the land of one of the numerous estates of the Collacchioni family. 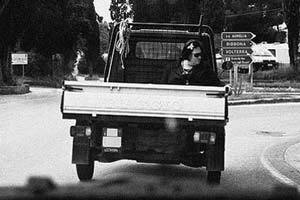 His body was hung-up in Capalbio's small cemetery and it is there that he was buried in an unmarked grave. Speculation has it that it is between the two cypresses behind the Greek column that he was hung up on. If you are into these kinds of things there is a plaque attached to the column. 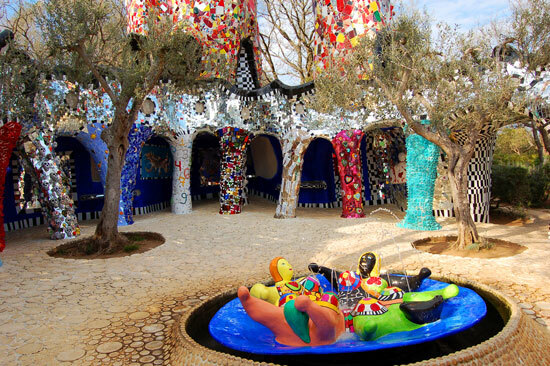 I still haven't visited this amazing garden down the road at Garavicchio by artist Niki de Saint Phalle, but I know from friends that it is magical. At Euros 12,00 a ticket (under 7's go free) it isn't a cheap half-day out for a family, but there is plenty to see and touch and photograph.